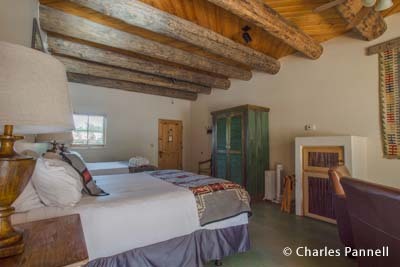 Located two hours north of Albuquerque, Ojo Caliente (www.ojocalientesprings.com) started out life a rustic retreat, but over the years it has matured into a five-star luxury resort. Today guests can soak in the natural lithia, iron, arsenic and soda hot springs, and then spend the night in a luxury cliffside suite. And although it wasn’t accessible back in 1868, access features have been added over the years, so now everyone can enjoy the healing waters at one of North America’s oldest health resorts. Although the resort offers several types of accessible suites, Suite 53 is definitely the most spacious and luxurious. There’s accessible parking in the nearby parking area, and level access over a flagstone path to the front door. Access features include wide doorways, tile floors and excellent pathway access throughout the suite. It’s furnished with two 28-inch high queen-sized beds with wheelchair access on both sides, an armoire, a refrigerator and a microwave. And if you’d like to curl up by the fire, there are two easy chairs in front of the cozy kiva fireplace. 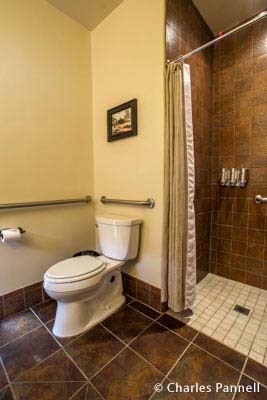 The equally accessible bathroom is equipped with a roll-in shower with grab bars, a hand-held showerhead and a portable shower chair. 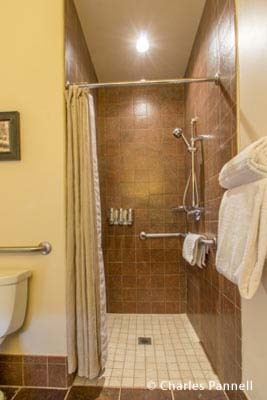 The shower measures 36 inches square, and the spacious bathroom includes a full five-foot turning radius. 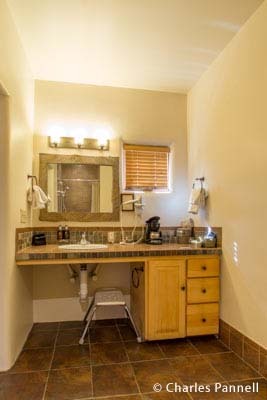 The toilet grab bars are located on the right and back walls (as seated), and there is also a roll-under sink and a large vanity in the bathroom. One of the best features of this cliffiside suite is the private back patio with a small hot tub. You have to be able to navigate three steps in order to use the hot tub, but the patio is a great place to lounge and take in the view. There’s also a table with chairs and two lounge chairs out on the patio. The new kiva pool is located in front of the suites, and although it’s a public pool it’s reserved for suite guests. There’s no lift access, because it’s a small pool, but the pool area is level and there’s’ plenty of room to maneuver a wheelchair. The spa area has also undergone a number of access upgrades over the years. There’s level access to the reception area, with ramp access down to the pool deck. The changing rooms each have a roll-in shower with a hand-held showerhead and a fold-down seat, along with accessible restrooms. The large pool has a lift, but you have to be able to do a few steps to access any of the smaller pools. There is also level access around the large deck area, so there are plenty of places to relax between soaks. And if you’d like a bite to eat after your soak, there’s ramp access up to the restaurant and bar, which is located next to the spa area. All in all, the access is quite nice at this luxurious resort, and you just can’t beat the healing waters. You’ll return home relaxed, well rested, and rejuvenated, and that’s a winning combination in my book.